Multicolor cascades available in six different color combinations, including red-green, red-white, and red-white-and-blue. Use the speed settings to create an enormous variety of effects, from strobe-like flashes to gentle transitions. A total of 648 possible setting combinations in all! Durable, efficient 5MM LED bulbs provide the light, each recessed into a star-shaped petal for greater light dispersion. Comes ready to use right out of the box; no programming needed. 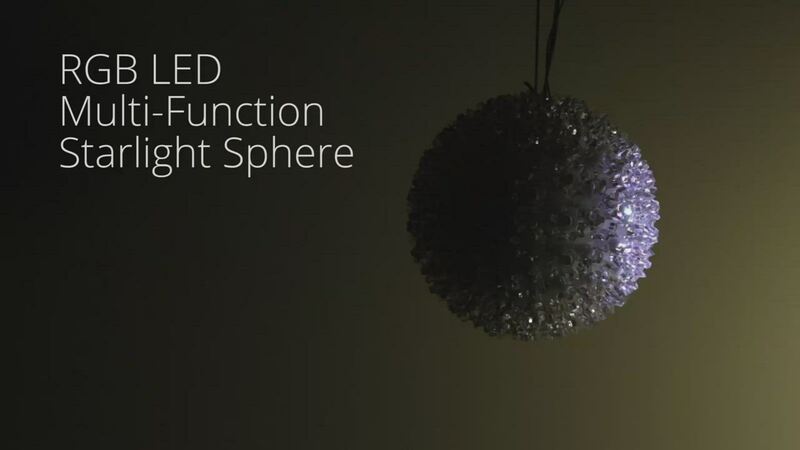 You wont find more versatile, entertaining lighting than this amazing starlight sphere. I bought it for next year, so right now, I don't know. Just tried out of the box to make sure the thing worked. I put it away 'til November 2018. The Good: Beautiful bright colors. Plenty of animation choices. Fun to watch. Looks like a mini fireworks show. One remote rules all. The Not So Good: Power cords are too short. These LED spheres do not allow "piggy backing". These factors complicate the installation, you may need some extra extension cords.